Samantha Britt15 years old, USA Madrid School "I loved Enforex. I started off learning for school, but ended up learning for my personal enjoyment. My teachers and classes where fantastic. I will recommend to my friends that they come here to learn." Maura Maginn65 years old, United Kingdom Alicante school "I feel I have learned a lot this week. Alicia, my teacher, has helped me develop the confidence to speak Spanish. I plan on continuing to practice speaking!" Cecilia Kiss From our Facebook page Sevilla School "I studied one week with Enforex in Seville and I learned a lot. It is a good school for foreigners and I recommend it to anyone who wants to learn Spanish. This is the third year I am studying Spanish and I want to tell Enforex THANKS FOR THE GREAT EXPERIENCE!" 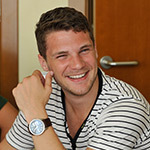 Bryon Andrew Shea26 years old, USA Barcelona School "I had a good time at Enforex. I really liked the teachers! Reina, Virginia, Sandra and Samuel were amazing in class, and Montse was awesome during our excursions. Thanks a lot Enforex!" 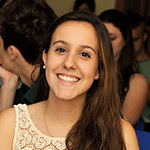 Viviana Morandi18 years old, Italy Salamanca School "One of the things that I really liked was that my teachers were really effective, nice and available." Valeria Capasso17 years old, Italy Barcelona School "It was a great experience and I felt at home thanks to the teachers at the Enforex school and the members of my host family." Philippe Coent52 years old, France Salamanca School "Competent and nice teachers. I am planning on studying Spanish again with Enforex." Jario Barbosa da Silva24 years old, Brazil Madrid School "My stay was perfect in Spain studying at Enforex. I had a great time during my 12 weeks. It is a very well prepared institution."